What It’s About: Evel Knievel (as himself) isn’t just a great motorcyclist: he is a great humanitarian, who breaks into orphanages at night to give the little tykes toys (of him on his stunt cycle, naturally!) and who teaches alcoholic mechanics (Gene Kelly) how to love their estranged children. Enter criminal mastermind Stanley Millard (Leslie Nielsen) who figures out the perfect way to smuggle dope into the country from Mexico: cause Knievel to die in a tragic accident, then ship the dope in Knievel’s funeral procession. Will Knievel get wind of this dastardly plot before it’s too late? Why Watch it Today? : Gene Kelly was born 100 years ago today. Before you come at us with pitchforks and torches, remember we’ve previously featured some of his greatest films: Singin’ in the Rain, On the Town, Brigadoon, Anchors Aweigh. Unfortunately the only other Kelly films I’ve seen are this absolutely jaw-dropping, so-bad-it’s-good trashterpiece, which shows just how low Kelly’s stock had fallen by 1977, and Xanadu, which is far more respectful, but possibly more insulting, considering it feeds off our memories of work in the studio era. 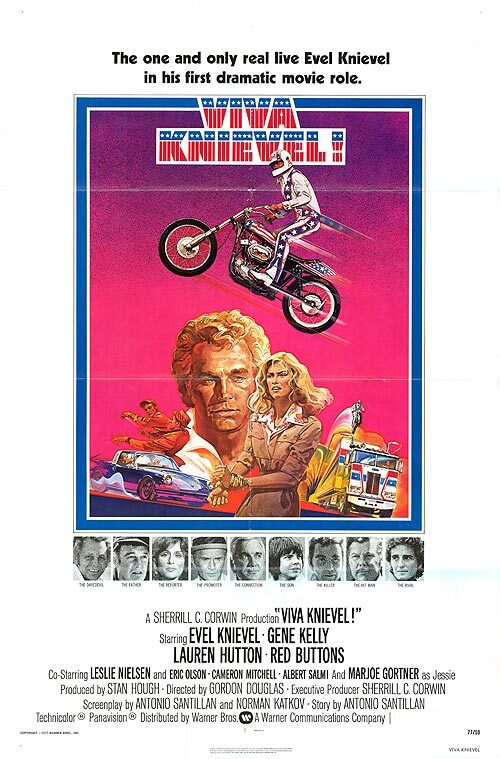 While Xanadu is a lot of fun in its own warped way, I picked Viva Knievel! because fans of bad movies really should see it, and it’s far less infamous. This entry was posted in Crime, Movie of the Day, So-Bad-It's-Good, Sports and tagged alcoholic, as himself, Cameron Mitchell, cash-in, Dabney Coleman, Drive-In, drug dealers, drugs, Estranged parent, Evel Knievel, father, father-son relationship, Frank Gifford, Gene Kelly, lady reporter, Lauren Hutton, Marjoe Gortner, Mexico, Red Buttons, reporter, The Border, the declining years, vanity project, Warner Brothers.